According to a National Study:Consumers are 63% More Likely to Buy from Chamber Members! 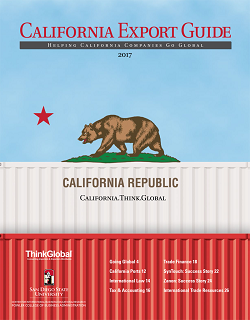 The California Export Guide is published by ThinkGlobal Inc in partnership with the Center for International Business Education and Research(CIBER) at San Diego State University. The guide provides expert advice and information for exporters. •Sign up for our Newsletters.........and more! See what's new and exciting at the Solvang Chamber! Representation: Issue based representation at the City, County and State level. Economic Development: Representation on the City of Solvang Economic Development Committee to promote, support and strengthen business in Solvang. Education: Chamber sponsored seminars and workshops on topics that directly affect your business. Resources: Mentoring and Referrals to valuable business organizations.